Make your lawn as festive as possible and dress your lawn geese in these adorable little Santa outfits! This Christmas, up your decorating level and dress up your lawn goose! If you already have the Large White Goose from Miles Kimball, this little Santa outfit is literally made for him. Get him his very own iconic red and white coat, black belt with a gold buckle, Santa hat with a white pom and an elastic strap, and a green sack for all the presents he has to deliver! If you don’t already have the goose, this outfit is definitely tempting enough for you to buy both now! 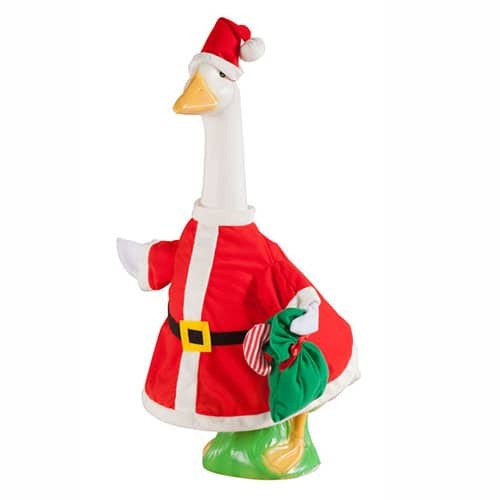 If you do decide to clothe your goose, get him a friend because the Miles Kimball Santa Goose Outfit is perfectly matched with a Mrs. Claus outfit! There’s even an elf version! You can have your very own North Pole: Goose Edition in your yard. When Christmas is over, Miles Kimball also makes geese outfits in the form of pilgrims, scarecrows, Easter bunnies, pumpkins, cardinals, love bugs, Frankensteins, peacocks, conversation hearts, Easter eggs, leprechauns, moose, lifeguards, flamingos, and more! Buy one for every holiday, and your house will always be the most festive in the neighborhood! The Miles Kimball goose is not included and is sold separately on the website.